Code Name S.T.E.A.M. tries to mix genres on the Nintendo 3DS. This hand held video game is part turn based strategy, and part third person shooter. In some ways Code Name S.T.E.A.M. feels like an attempt to do a first person turn based strategy game without the first person view. Players are limited to what their characters can see. So if there is a high wall, an enemy may be hiding behind it. If your characters are high you can see the enemies move around. If not, then you in a fog of war situation. Code Name S.T.E.A.M. contains tons of violence. We shoot, and blow up all of these alien characters (many of whom look the same). Code Name S.T.E.A.M. also contains blood and enticement to lust. Neither of those were really needed. The cel shaded graphical style will either be embraced or despised - it depends on how you feel about that graphical style. Code Name S.T.E.A.M. is such a hacker. The computer loves to throw enemies at you out of nowhere. So the only way to play Code Name S.T.E.A.M. is to go slow, and keep your team together. When you get close to the goal spaces you can try to make a run for it. Code Name S.T.E.A.M. is so hard that few players will try to clear everything out in each level. There are saves within the levels of Code Name S.T.E.A.M., which is helpful. Especially since things can go bad really fast in this 3DS video game. The sound bytes from the characters gets annoying quickly. The attempts to redefine history in this steam based game is annoying. The whole steam concept is neat, however it is too slow, and way too limited. 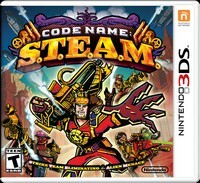 I rented Code Name S.T.E.A.M. for this review. When the game comes down to fifteen to twenty dollars I will consider buying it. It is not worth any more than that. Code Name S.T.E.A.M. is also a game for the older members of the family since there is so much adult only content. The difficulty, and controls will also turn many families away. Expect to drain the battery of your 3DS with this game since the battles are so long. There is a quick save if you really have to go.